Almost a year in the making, LIT Playing Cards is finally ready. Designed after timeless classics such as Wynn and Jerry's Nugget. We wanted to create a deck that has a beautifully simple and minimalistic design. 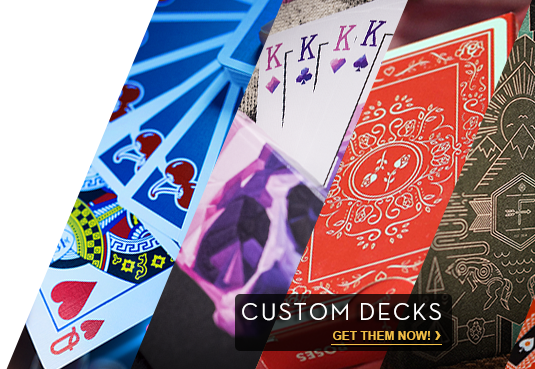 Our goal was to design a deck that appeals to collectors, cardicians and technicians on every continent. Whether you are simply looking for quality playing cards for everyday use or you are a modern card technician in the market for fashionable tools, LIT Playing Cards offers 52 bits of pure handling perfection. This stunningly sleek deck is an all-purpose deck that isn't too showy for the professional performer. LIT Playing Cards are flexible straight out of the box. They have a high-quality embossed finish that gives this deck the amazing feel that card men and women have come to expect from premium, high-quality playing cards. We invite you to become part of the LIT family! Beautifully simple and minimalistic design. A unique Ace of Spades. LIT Playing Cards are printed on a crushed casino grade Bee stock. The cards have an embossed finish. This finish is commonly referred to as Air-Cushion, Cambric, Linen or Magic finish. Traditionally cut for the professional. Easily interlace the cards to produce crisp, clean shuffles. Manufactured with a premium paper stock. Decks wrapped in cellophane for protection.